Another tasty and affordable extreme processing plugin from Sinevibes, albeit one very much tailored for dirty electronica. Good and versatile effects. Simple but effective modulators. Easy to program. Chaos function is effective. No wet/dry mix. No modulator shuffle. Sinevibes specialises in affordable, easy-to-use, creative plugins for Mac (AU). 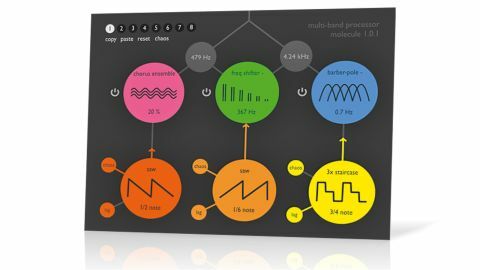 Its recent efforts have largely focused on rhythmic effects generated by clever combinations of sequenced waveform modulators and gating, but its latest, Molecule, steps off that now pretty well-trod path, instead bringing together multiband processing (drawing on a varied roster of sound mangling algorithms) and LFO modulation. The fundamental design of Molecule is deceptively simple. It centres on three effects modules, each set to process a user-definable frequency band, with the two crossovers ranging from 100-500Hz and 500Hz-5kHz. "It works wonders on leads, basses, drum loops, even vocals; and it can also be very effective on an auxiliary bus"
Each band can be disabled completely, muting its frequency range - useful for things like isolating and processing the bassline in a sampled loop, say. Alternatively, each band can be bypassed, allowing the dry signal to pass through. All three modules have access to 16 distinct effects: Comb Filter (in positive and negative versions), Chorus Ensemble, Ring Modulator, Frequency Shifter (+/-), Barber Pole (+/-), Sample Rate, Bit Depth, Circuit Bender, Analog Drive, Hard Clip, Foldback, Transformer and 2x Transformer (the last six are available for the low band only). Most of these will be familiar, but the likes of Barber Pole (a bizarre phasing/pitching effect) and Circuit Bender (a noise- and distortion-inducing filter) are more adventurous. One thing they all have in common, though, is that they're designed to colour the sound in creative ways, rather than overtly transforming it into something altogether different. Although each effect only comes with one adjustable parameter (frequency, gain or depth), simplicity is, as ever with Sinevibes, key; and modulation is on offer for introducing some movement. Molecule is a surprisingly versatile dirt-imparting plugin. Its particular strengths lie in distortion-style effects (especially of the 'digital' variety) and phasing/flanging - from subtle to extreme. It works wonders on leads, basses, drum loops, even vocals; and it can also be very effective on an auxiliary bus, receiving a variety of signals (bass, kick drum and light percussion loop, for example). However, it's definitely at its best on less busy material - feed it too many notes from too many different sources at once and the risk of it all dissolving into an unpleasant and unrhythmic sonic mush becomes very real. With Molecule being so useful as a bus/ parallel effect, the lack of wet/dry mix control is puzzling. We also found ourselves missing that Sinevibes staple, the shuffle control, for swinging the modulation waves. This might be trickier to implement on waveforms than sequencer events, but it's exactly the kind of thing we'd expect from Sinevibes. The developer's trademark Snapshot system and Chaos function are onboard, however, and here the latter really shines, serving up some excellent starting points and presets in partnership with the band mute function. Finally, the preset list is a little spartan, especially considering how effective the Chaos button is at generating presets. That said, Molecule is a plugin that rewards experimentation and randomising, so this isn't a major issue. Molecule certainly isn't for everybody, but for those working in electronic genres and seeking a bit of creative filth, it's worth the price.